Jonathan and Rachel, live in their large semi-detached home in Ealing. The project brief given to Model Projects, was to create a single storey side to rear extension. The new space will provide a new kitchen, dining and family area for the family to enjoy. The ground floor originally contained a living room to the front with dining room behind. To the rear of the ground floor a kitchen was located with a further dining room beyond. Jonathan and Rachel wished to keep the front of the house the same, however, wanted to create an open plan family space to the rear. 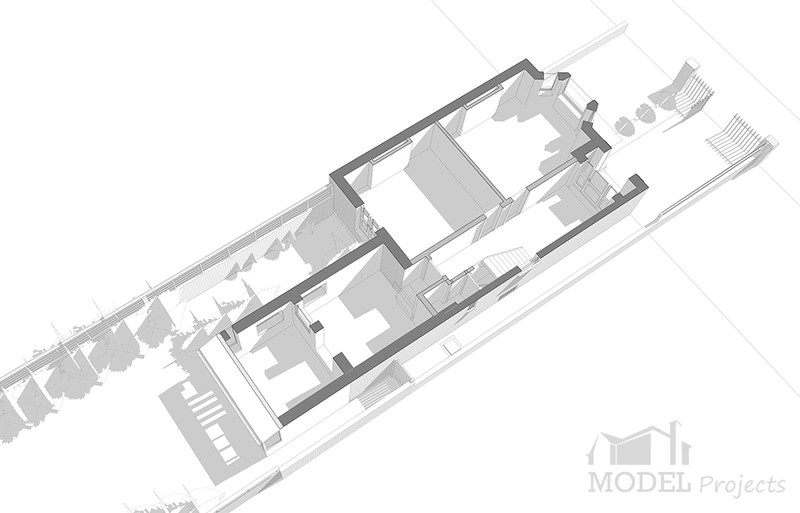 Model Projects created a design that was an “L-shape”, wrapping itself around the existing building. 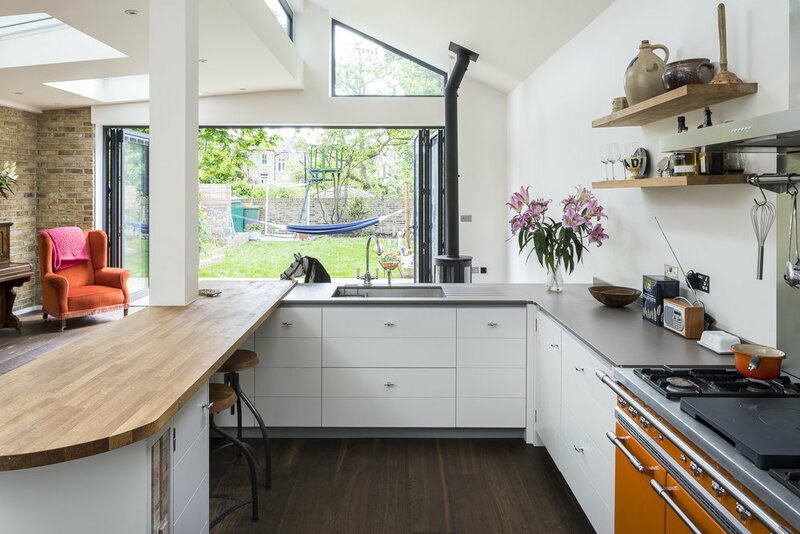 The right side of the extension was designed with a pitched roof and contained roof lights and a feature window to the front.The roof was designed with tiles to match that of the main house. To the left hand side additional rooflights ensured the space below was filled with natural light. Large bi folding doors were added across the width of the rear providing light and a full view of the garden beyond. Model Projects worked closely with Jonathan and Rachel to produce separate functional area’s from the newly created open plan space. To the right hand side, a u shaped kitchen, with white units and grey worktops provided the ideal space to cook and prepare meals. This was separated off with a wooden worktop and a column to provide a clear divide from the kitchen to the more relaxing area’s beyond. To the left hand side an eating area was created, with a fixed “L-shaped” bench accompanied by a large table. A feature wall of exposed, london stock brick runs along the full length of the wall. Towards the rear, a cosy corner was designed with a log burner, providing a place to relax and enjoy particularly in the cold winter months. This was positioned to over look and enjoy the garden. A rear garden terrace provided a connection from the main house towards the garden. An approved planning application was granted through a full planning application.